c) phonetic signs, introduced to transcribe the name of individuals, marked the turning point when writing started emulating spoken language. It is accepted by all that writing developed on the basis of earlier existing pictographs and ideographs.The Sumerians were a people who built first civilization,which flourished between 3500 to 2200 BC and they were the first people,who developed a writing system known today as cuneiform. It flourished between 3100 and 2000 BC and it fell into disuse after this time, scholars succeeded in deciphering it last century and today we can read all of the many thousands of surviving cuneiform inscriptions. The earliest clay tablets in Sumeria were examples of prewriting; The pictographic impressions did not render the sounds of the Sumerian language, but were used simply as memory aids in recording economic data. This earliest Sumerian record keeping was a way of keeping inventory of merchandise by drawing crude pictures of each item.The first proven uses of cuneiform to denote the sounds of the Sumerian language appear in clay tablets dating to about 3000BC. 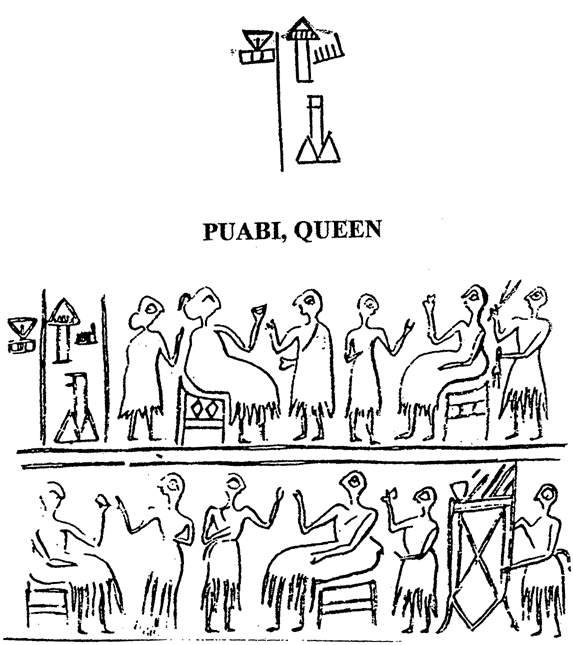 Some of the Sumerian glyphs were being used to represent sounds using the rebus principle. These were found at Jemdet Nasr in present day Iraq. On one of these tablets, for instance, the Sumerian symbol for arrow was used to convey the word meaning life. There is no logical connection between the depiction of an arrow and the concept life. Only when looking at the sound of the Sumerian language does the reason for using the pictograph in this way become understandable. The Sumerian word for arrow was 'ti'. The word for life was a near homonym, 'til'. 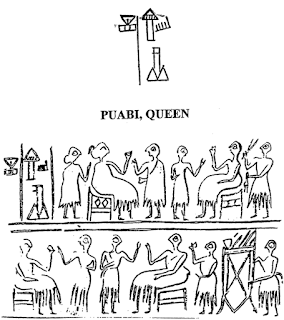 Since the concept life was hard to draw, some scribe took advantage of homonymy and used an existing pictograph to denote the sound of the syllable ti regardless of the original meaning of the pictograph. In exactly the same way, the pictogram for reed was used to convey the semantically unrelated concept reimburse: In the Sumerian language, the word for reed and reimburse were both pronounced something like 'gi'. Pictograms thus began to be used as sound symbols. The symbol which resembled an arrow, now denoted the sound syllable 'ti' which could be used to write not only the word for arrow but also life and many other words whose meanings are unrelated. When the transition from icon to sound symbol was completed, and it became possible to symbolize all the syllables of the Sumerian language regardless of how abstract their meaning, true writing was born. After the 3rd millennium BC it took a conventional form of linear cuneiform drawings and was written from left to right. This, the creation of phonetic signs—signs representing the sounds of speech—marks the second phase in the evolution of Mesopotamian writing, when, finally, the medium parted from its token antecedent in order to emulate spoken language. As a result, writing shifted from a conceptual framework of real goods to the world of speech sounds. It shifted from the visual to the aural world. After the Sumerians, the idea of writing seems to have diffused to many peoples of Southwest Asia and adjacent areas developed writing.These include the Egyptians and the Indus Valley peoples . Many people mistakenly assume that--because the earliest syllabaries such as Sumerian, Egyptian and others use symbols that resemble pictures--they represent a more primitive form of writing. But all of these systems represented sound first and concept secondarily--through the medium of specific sounds. With state formation, new regulations required that the names of the individuals who generated or received registered merchandise were entered on the tablets. The personal names were transcribed by the mean of logograms—signs representing a word in a particular tongue. Logograms were easily drawn pictures of words with a sound close to that desired (for example in English the name Neil could be written with a sign showing bent knees ‘kneel’).For example, When a name required several phonetic units, they were assembled in a rebus fashion. A typical Sumerian name ‘An Gives Life’ combined a star, the logogram for An, god of heaven, and an arrow, because the words for ‘arrow’ and ‘life’ were homonyms in sumerian language. For example,Pictograms are precursors of writing systems.– pictogram: an image or Pictures that represents an object and resembles it. A "pictogram" is a sign signifying something but which does not represent language. An example is a sign representing a telephone to indicate where a telephone is available. It is understood by anyone who knows what a telephone is and is not dependent on any particular language. Pictograms become standardized, and their meanings get extended to related concepts (but not specific words). Thus, they become ideograms- Pictures which represent ideas. Example : the picture of sun can represent also- warmth /light /daytime. Ideograms eventually become associated with specific words. Thus, they become logograms-a sign which represents a word or morpheme and often become associated with homophonous words [e.g., new and knew-having the same pronunciation but different meanings, origins, or spelling,] in a language.The main difference between ideograms and logograms is Ideograms directly represent the ideas rather than words, while logograms represent the ideas through words. Similarly the main difference between pictograms and ideograms is Pictograms are pictures or images which are created from an object which resemble what they signify, On the other hand, ideograms are symbols which are crated from geometric shapes and they also represent ideas. However, people can use both of them to communicate each other. Especially, in the history, Egyptians, Sumerians, Aztecs, American Indians and even cavemen used pictograms and ideograms to communicate and preserve their knowledge. Moreover, Pictograms are more “picture like” forms, but ideograms are more abstract derived forms. For instance, you can tell the ‘sun’ with a pictogram, but you can tell the ‘heat’ only with a ideogram. Because of that, understanding ideograms sometimes might be more diffiucult than understanding pictograms. There are some common points for both of them. İdeograms and pictograms do not represent words or sounds in a particular language. When people starts to use pictograms like a word in a language, they are defined like word-writing, or ‘logograms’. The difference between logogram and pictogram is that logogram is a character or symbol that represents a word or phrase (eg a character of the chinese writing system) while pictogram is a picture that represents a word or an idea by illustration. Then Logograms become associated with a syllable, thus becoming syllabic writing! So , Writing system began as pictographs, later becoming ideographs, logographs and then syllable characters. That is,In brief: Pictograms → ideograms → logograms → syllabic. Phonetic signs allowed writing to break away from accounting. Inscriptions on stone seals or metal vessels deposited in tombs of the ‘Royal Cemetery’ of Ur, c. 2700–2600 BC, are among the first texts that did not deal with merchandise, did not include numerals and were entirely phonetic .The inscriptions consisted merely of a personal name: ‘Meskalamdug,’ or a name and a title: ‘Puabi, Queen’ [Name and title of Puabi carved on a seal recovered in the Royal Cemetery of Ur is attached/picture:02]. These inscriptions introduced syntax, thus bringing writing yet one step closer to speech. So ,this is the last step to a full and independent writing system ,which was the creation of new cuneiform signs not based on an original token design. That must first have happened when the thing being represented wasn't a commodity of exchange at all in the traditional token economy, no "sheep" or "bar of metal," but something like "star" or "man." It also clarifies why many are expressed as a rebus, a "word-picture" in which the elements of the word are written as separate and unrelated pictures, like writing "carpet" by drawing an automobile and a cat or dog. The original Sumerian writing system derives from a system of clay tokens used to represent commodities. By the end of the 4th millennium BC, this had evolved into a method of keeping accounts, using a round-shaped stylus impressed into soft clay at different angles for recording numbers. This was gradually augmented with pictographic writing using a sharp stylus to indicate what was being counted. Round-stylus and sharp-stylus writing were gradually replaced around 2700–2500 BC by writing using a wedge-shaped stylus (hence the term cuneiform), at first only for logograms, but developed to include phonetic elements by the 29th century BC. About 2600 BC cuneiform began to represent syllables of the Sumerian language. 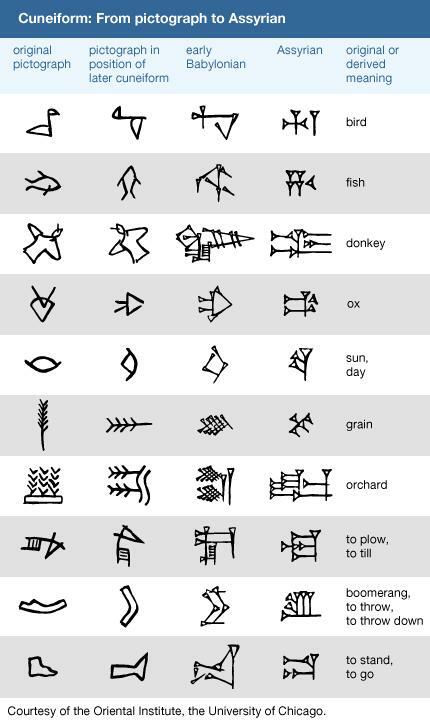 Finally, cuneiform writing became a general purpose writing system for logograms, syllables, and numbers. From the 26th century BC, this script was adapted to the Akkadian language, and from there to others such as Hurrian and Hittite. So,In brief,the pictures began as representing what they were, pictographs, and eventually, certain pictures represented an idea or concept, ideographs, and finally to represent sounds.Eventually, the pictographs were stylized, rotated and in impressed in clay with a wedge shaped stylus to become the script known as Cuneiform.For example,The pictograph for woman- -, became in Cuneiform writing. In general, Written language was the product of an agrarian society. These societies were centered around the cultivation of grain. A natural result of the cultivation and storage of grain is the production of beer. For example,to keep their product,the grain, for long time,it was often baked and stored.Some 6,000 years ago,ancient sumerian text reveals that eventually it was formulated that the sweetest grain, if baked,left out, moistened,forgotten,then eaten,would produce an uplifting,cheerful feeling. Intoxication at the primal level The first beer! Therefore, It is not surprising, that some of the very oldest written inscriptions concern the celebration of beer and the daily ration allotted to each citizen.The signs of the Sumerians were adopted by the East Semitic peoples of Mesopotamia and Akkadian became the first Semitic language and would be used by the Babylonians and Assyrians.A Cuneiform chart also is attached as an example. 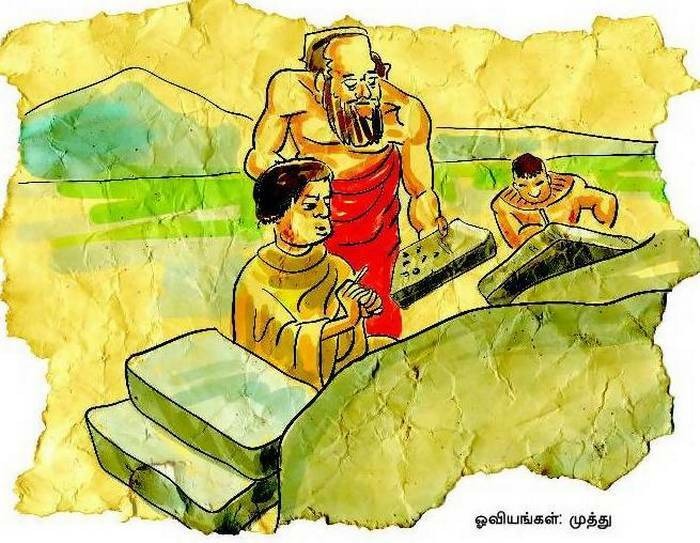 எந்த ஊர் ஆனாலும் தமிழன் ஊர் தஞ்சாவூர் போலாகுமா ? வெளியாகும் விந்தைகள் .உங்களுக்கு தெரியுமா ?